Wentworth Netball Fun and Fast Play. On Sunday night Team One and Two spent a great night out watching the Mystics beat the Tactix. A great game to watch and learn from with the win only coming in the final quarter. Team One then went on to replicate the game by beating Whangaparaoa One at a training game on Tuesday night and beating them also in the final quarter. The girls' play was outstanding with some new combinations coming together beautifully. This gives us confidence for grading. Team Two will be playing an Orewa College team in the holidays as their training game. Four Wentworth College boys attended the Inter-School Motocross competition in the backblocks of Huntly on Friday 4th April. Logan and Jed Murman, along with Henry Williams, headed off with an early start to beat the Auckland traffic. They hit fog at Meremere and had a slow winding journey through Waikato farmland with visibility down to 50m. Nevertheless they arrived with plenty of time to sign in and catch up with Bowen Hopper – the other team member. 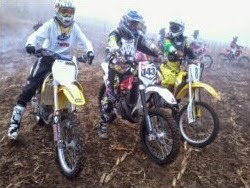 On the 'look lap' to get the know the track, the fog was thick and stuck to the boys’ goggles, and they were also coated with an icing of dust from the freshly harvested maize paddock. However the sun eventually burned away the fog, and racing got underway. 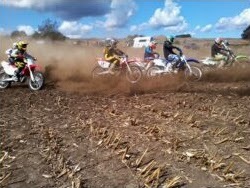 The damp soon turned to dust and the organisers had to water the track. While the team did not bring home any silverware, they did enjoy racing against 170 other students. Jed took a huge crash at the start of the third round but walked away with only a few bruises. The Wentworth team hopes they can field a team again next year! During the weekend 13 Bronze Duke of Edinburgh students, 2 teachers (Ms Worthy and Ms Fisher) and Malcolm Haggerty, a parent, went for a wander over and down the Waitakeres. The weather was, as usual, perfect and everyone had a very enjoyable time. One group decided to cross the main stream and they got wet to the armpits. However, the swamp itself was incredibly dry with almost no water in it. A couple of students still managed to fall into the only puddles of water that were around though! Thank you very much to our three drivers for the weekend: Mani Faletanoai, Greg Main and Chris Langdon. They drove for many miles to ensure we could get home at the end of the weekend.